Find Rabby! People Of Brighton - Can You Help? Brighton Bloggers of the UK, this is my last resort and I desperately need your help. This has been the worst day of my little boy’s life and tonight he has spent most of the evening grieving and in tears. 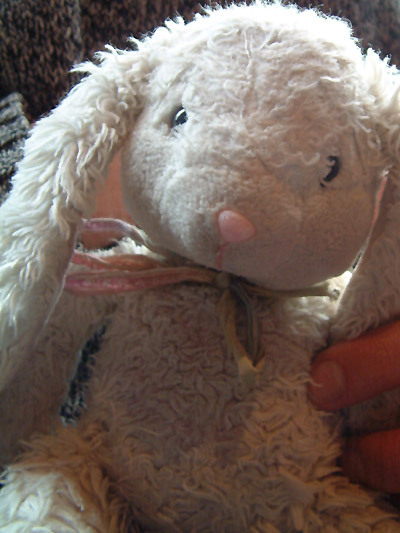 This morning, the 1st September 2007, my little boy lost his bestest ever friend – a companion who has been with him every day since he was born; a friend who has been there through good times and bad times… Sam’s rabbit Rabby. The most Important; the most Beautiful; the most Magical… Saggy old cloth rabbit in the whole wide world (on the right of the picture). In WHSmiths at Brighton Station around 11:43am this morning, Sam took off his Superman rucksack so that he could look at some Simpsons magazines. In his excitement he forgot to pick it up again. A simple mistake that would result in unimaginable heartbreak. Was anyone at the station around that time today who might have seen something? Does anyone know the whereabouts of his bag? Can anyone help bring back some happinesss to a little boy who is beside himself with grief? Has anyone seen Rabby? The day began with an impulsive decision to head north to London and go to the Natural History Museum. Little did me or my two children know of the events that were to unfold. Events that would cause a young boy to face the painful fact of loss in life. A singular mistake – a poor choice – that, as parents, we always hope our children would learn the lessons of when we feel they are ready to handle it. But loss can strike at any age. No matter how much we hope for the best. All our efforts to find Rabby today have been in vain. Within the few minutes that passed between Sam taking off his bag; me purchasing magazines for us; boarding the 11:49 for Victoria; my realisation that he didn’t have his things and us getting off the train, it would appear that someone took his bag and has not handed it in to lost property (yet, we hope). My 10 year old girl did a fantastic job on both consoling her brother whilst simultaneously helping to reconstruct the events to locate the precise location of where his Superman bag could have been left (note: a distraught six year old is very hard to get information out of). We searched the ticket office, Marks and WHSmiths as well as asking at the information desk if anyone had been kind enough to hand the bag in. Unfortunately, no-one has. My (ex)Wife even called the British Transport Police, the local buses as well as the train station to report the matter of Rabby’s disappearance. Bless her. She’s a good woman. And I mean that sincerely. Just recently, on Brighton beach just by the struts of the collapsed West Pier, Sam found a mobile phone as we were strolling home for the afternoon. Quite a new and expensive one by the looks of things. He was very concerned that the person who had lost it should get it back. That’s the type of kid Sam is – just, fair and community minded. Both the kids made me ask around to see if anyone had lost it. We looked for somewhere to hand it in but there isn’t really a lost property office on the beach. We took the phone home and waited to see if it’s owner would call. At home, both the kids urged me to do something about the situation so, after about 45 minutes trying to work out how to unlock a Sony Erickson phone, I managed to discover that the owner’s name was Joe and decided to attempt to contact some of the people listed under the contacts section. After a couple of calls, a few of Joe’s friends were alerted to the fact that we were waiting for him to collect the phone. To cut a long story short – Joe did finally call us and we were able to successfully return the mobile to it’s rightful owner. As it transpired, he only lives down the road from us (and probably shops at the same supermarket!). Both my kids really are “model kids”. In both senses of the word. They’re good, kind, thoughtful people that try to do their best to help people. They mind their P’s and Q’s and I have their mother to thank for that as I wasn’t really around enough to contribute to the foundations of my children’s character (9 to 5′s with a heavy commute really do destroy relationships). And if you’re in Kemp Town, passing by QS – look up at the poster in the shop window: that’s my little girl! She really is a model. They both are. It’s been said that “what goes around, comes around”. The question is, in what form? Are things that get lost and returned repayed by the Karmic wheel in an equal way? If so, this would be a just and suitable form for the heavens to return something precious back to Sam. After all, it was his persistence that reunited someone with something precious they had lost. The tragedy that my little boy has faced today is much like anyone facing the death of a member of their family. Rabby has been there every single day of Sam’s life. He’s been there on trips from Cornwall to Malaysia; at weddings and christenings and other social occassions; when Sam has hurt himself through to helping my boy recover from a painful emergency operation that he had to endure. More recently, Rabby has been there when my wife and I separated. How would you feel if the person who brought you comfort and security was taken away leaving only despair? “Gutted” doesn’t even come close to expressing this emotion. And tonight, nothing can help bring this six year old the security he needs. Tonight, a young boy sleeps restlessly without the warmth of his mother to comfort him. I’m a great believer in the goodness of people. More so in Brighton than in most places. People say “Thank You” to the bus driver – a minor detail in the fabric of everyday life but one that makes it a pleasant place to live in. It is the goodness of the community that initially attracted me here. It is the goodness that I hope will bring Rabby back. That’s not to say that I don’t think there aren’t any bad people out there. There are. They just live in London and come down for day trips. Well, mostly . Dodgy people. The type of people that would take a kids bag. I’m kidding of course… But who would want to take a kids bag? I certainly hope that it was the good folk that innocently took his bag with an intention to return it to the proper authorities. At least, that would give us a fighting chance at getting his friend back. There were other items in Sam’s Superman bag – toys that were brought along to make the journey to London an enjoyable one. Bits of lego and figures etc. These can all be replaced. We’re not too bothered if we don’t get the bag or the toys back. But we are bothered by Rabby being taken away. He is the one thing that can’t be replaced. I have no idea. I’m all out of ideas. The reason for this blog post was because I promised my little boy that I would do everything in my power to help find Rabby. We all miss him and well, who knows, maybe someone from Brighton reading my post might know something or someone who has found Rabby. It’s a long shot but a blog about something that really matters is definitely “in my power to help”. And a promise is a promise. “Help me Brighton Community. You’re my only hope!” (that’s for all the Jedi’s out there ). Best of luck finding Rabby!